This is a topic for discussion & fotos of Nest #9. 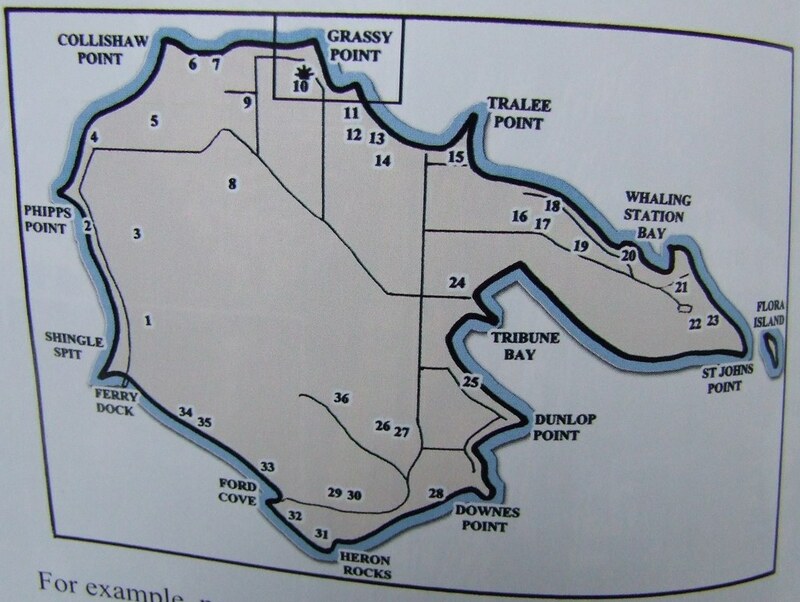 Here is Doug*s map of the nests of Hornby Island for reference. Last year i was keeping my eyes on the road as i should have been. This year i*m keeping my eyes on the skies & the trees instead. 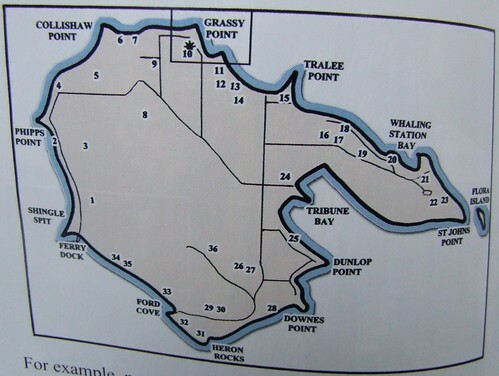 So, i*m noticing the Ma & Pa of nest #9 a lot more now. 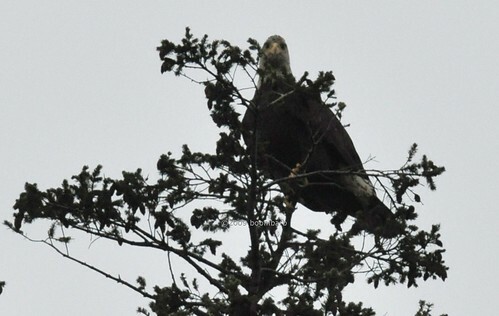 They perch in the tippy top of a tall fir in the back of my yard. 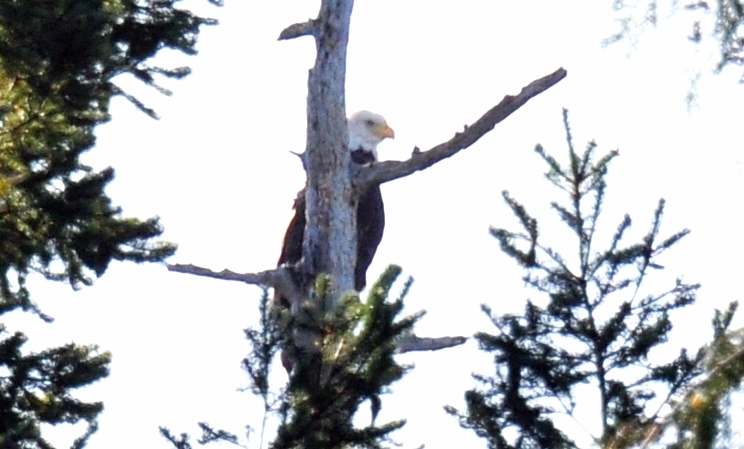 They also perch in a tree across the street from me. i*ve been noticing one of them in this other perch tree a lot, especially at dusk. They were in this tree mid afternoon october 16/2009, so i set up my camera. Look at the tippy top of the tree, all the holes in it. It was a bit of a dull day, but there was just enough light. i was sitting at my computer desk october 23/2009 going thru my fotos looking for good ones to use as gifts when something out the window in front of me caught my eye. & it looked as tho they landed in the tree in my backyard. So, i ran & got my binoculars. It was raining, & my windows were all messed up. But i could see this wasn*t an adult! 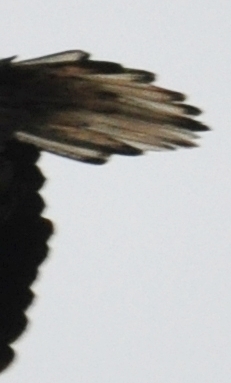 Was this a juvenile or a sub adult? i ran & got my camera & got some fotos. i think this is a juvenile, probably from nest #9. Nest #9 seemed to have only one eaglet this year. 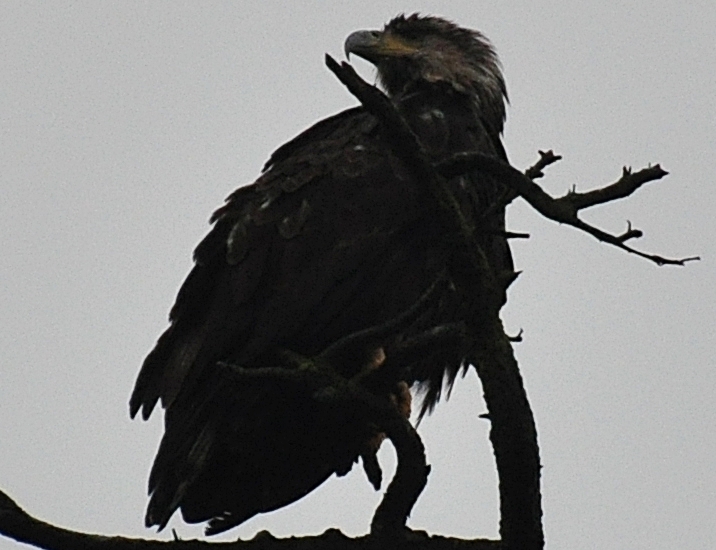 Here he is after he fledged. Listen to how sweet his call is! Great shots of that juvie Booni!!! Wow you looked to be pretty close!! Thank you!! 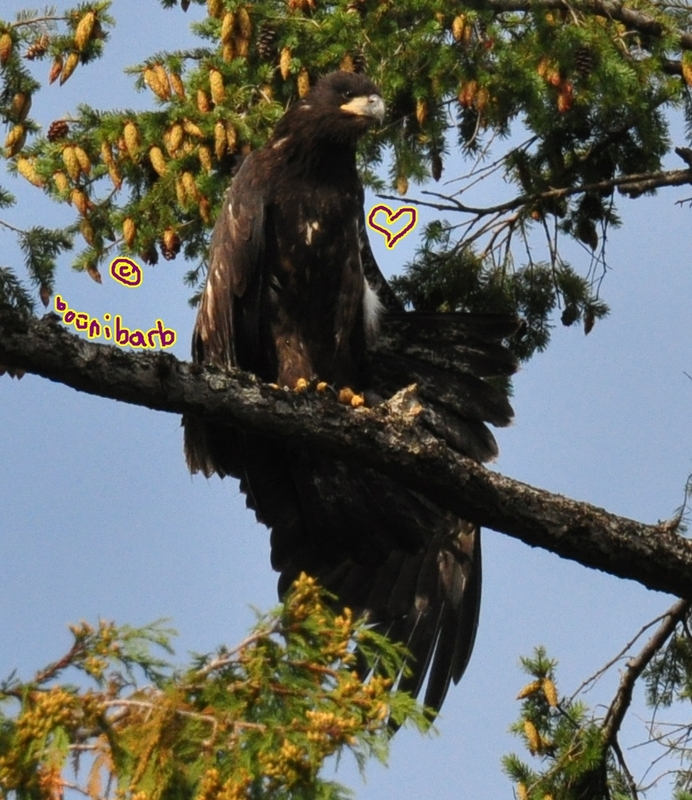 07:26 - i could hear eagles twittering, but it wasn*t coming from my speakers! So i turned them off, & realized it was the nest #9 eagles! Then i heard twittering from the speakers as well. Maybe they heard each other? 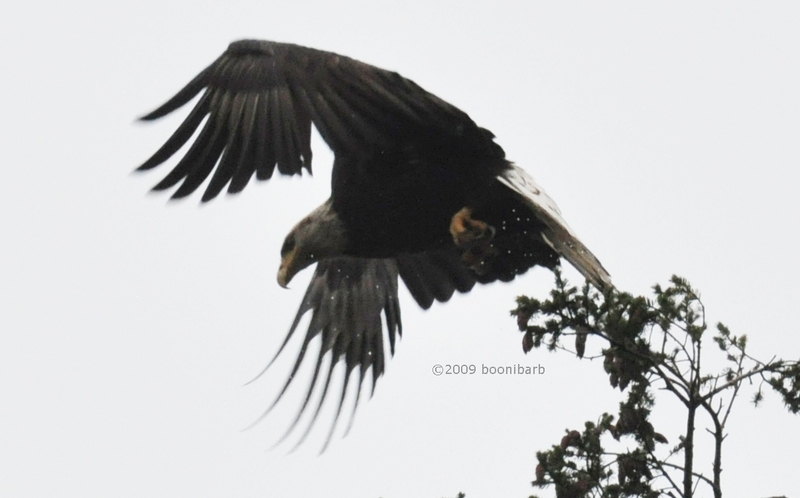 #9 fledgling was a sweet little eagle. 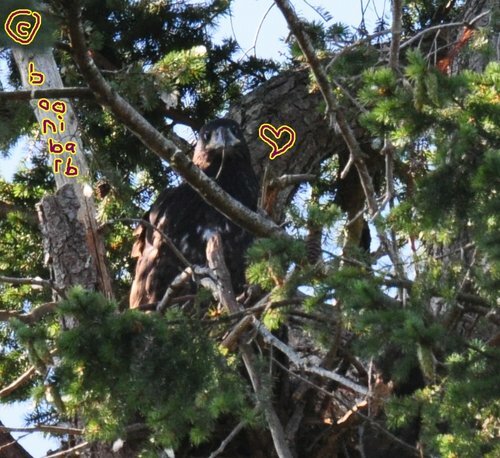 So today when i got home in between jobs, there were ravens in the huge fir in my back yard, as there often are. But then i heard something that made me take another look. The ravens were gone, & an eagle was at the top of the tree now! 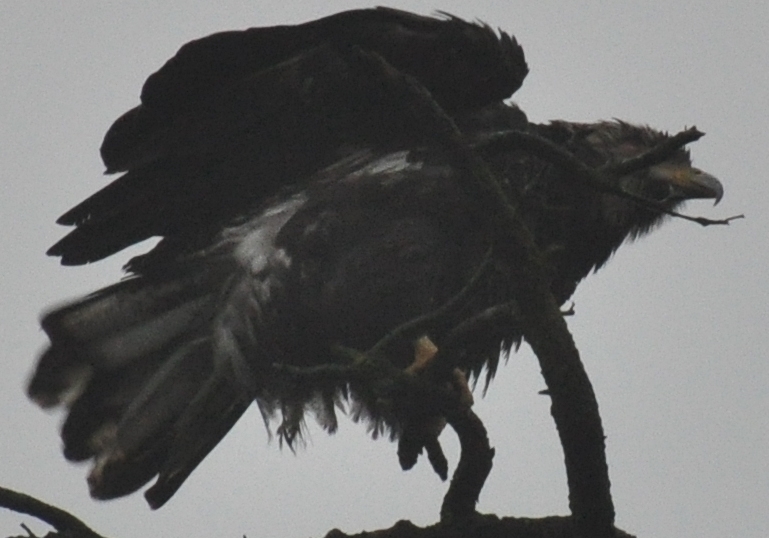 i ran to get my camera, & while i set it up, the two ravens were doing their best to get the eagle to leave the tree. They succeeded before i got my camera set up. 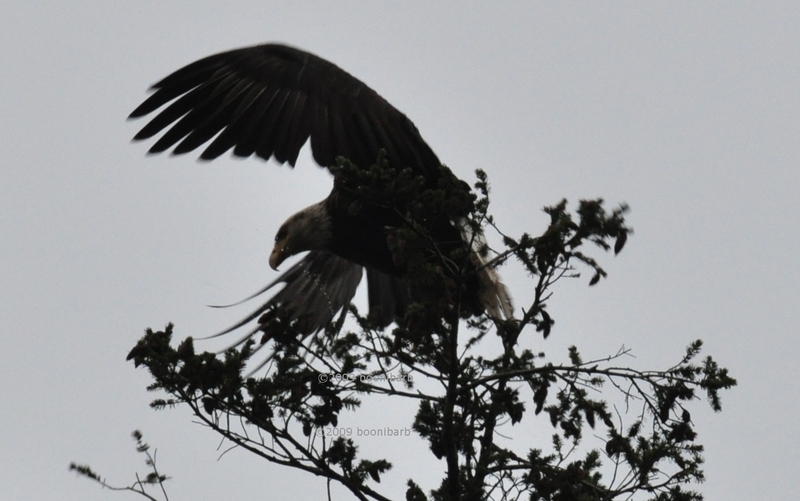 They flew after the eagle, kind of dive bombing it. 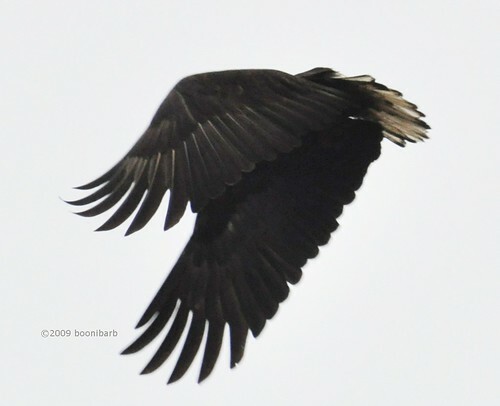 i was thinking ravens & eagles tolerated each other. 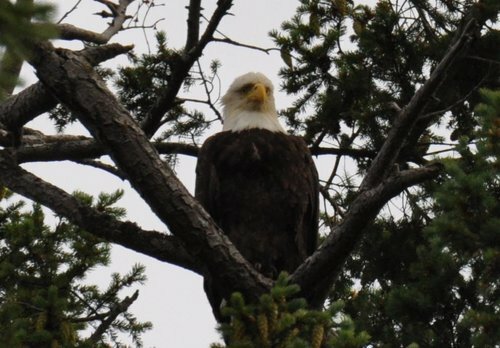 i*m not positive, but i think the eagle was an adult. 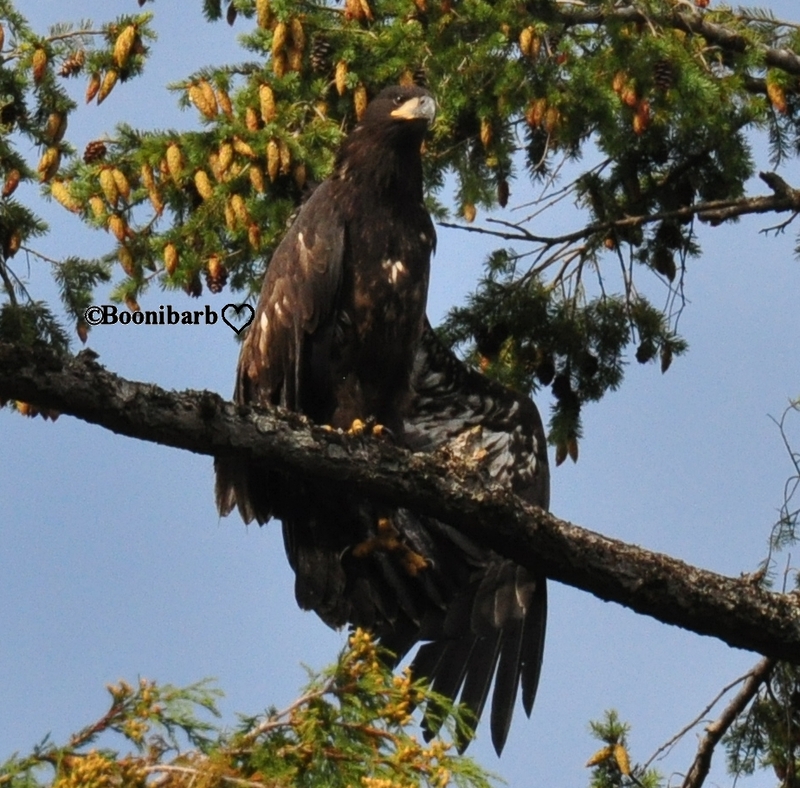 i would*ve loved to*ve gotten a foto tho, in case it was that immature eagle again. 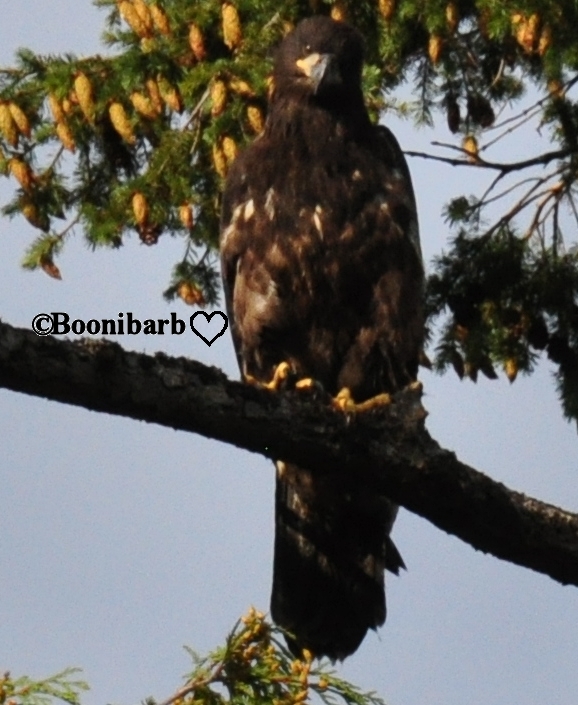 Booni, wonderful to have an eagle so close! 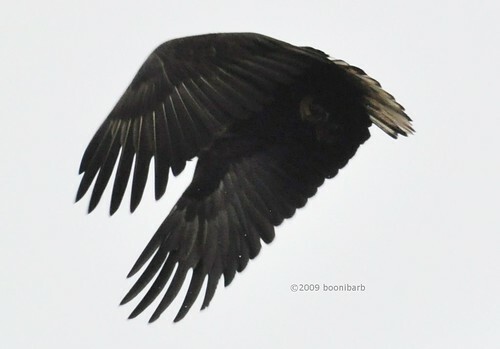 I hope it comes back, but the ravens seem to think they "own" that tree, from what you said! Today i got home & a strange sound made me look up to the tree in my back yard. An eagle was perched in the very top of it! There was very low cloud, & they were in it, in the top of the tree. i ran to get my camera. When i returned, they were gone. But then i looked in the tree across the road from me, another tall Douglas Fir, & there they were in the top of THAT tree! 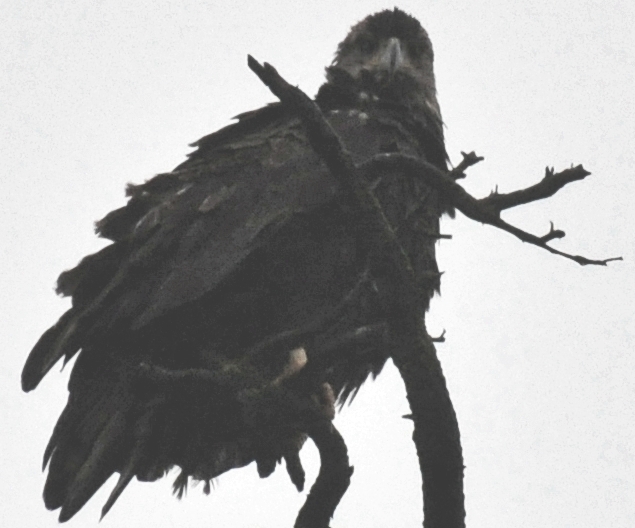 i thought this was an adult by what i could see in the dim light, but i just had a feeling they weren*t, just by how they were perched & behaving. Sure enough, when i looked at my fotos, a sub adult!! It was pretty dull light, so i had to really lighten this foto up to show you anything. 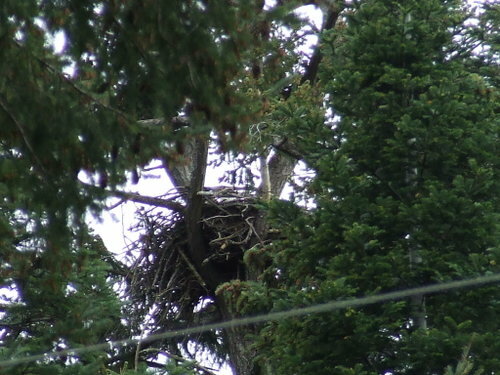 i think this is a nest #9 eagle, because i consider this tree to be part of the nest #9 territory, but i don*t really know. You can see the white mixed with brown head feathers here. In this one, the wing must*ve flicked the branch, & you can see the water droplets flinging off the branch beside the eagle*s face. Water droplets in this foto too. 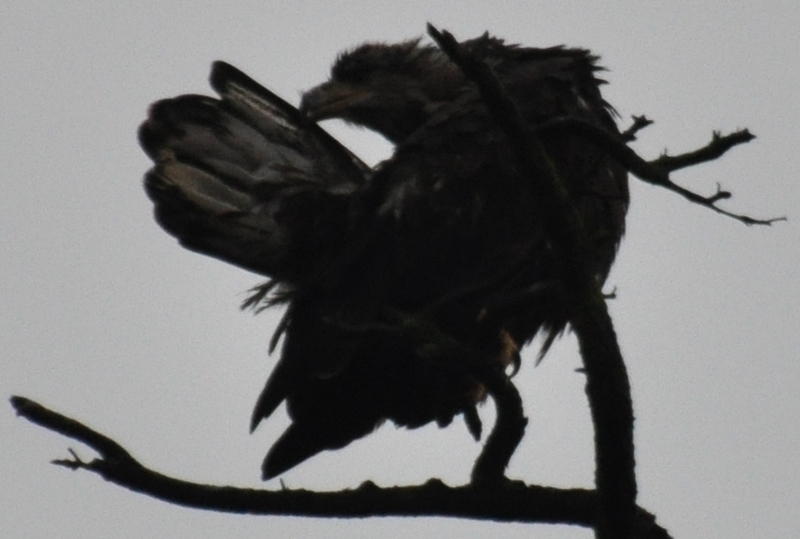 You can see the white mixed with brown tail feathers in this one. Final view of the tail. Exquisite boonibarb! Such a gift!